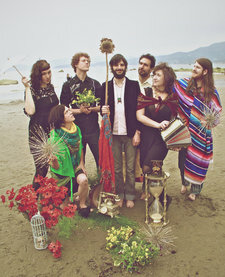 Frolicking somewhere between the dusty vintage past and the psychedelic rafters of the future, Buffaloswans are a five-piece beast from Vancouver, BC who play in the fields and forests of Cosmic American Music. Their live performance is a shimmering achievement within the local music scene in Vancouver where they have performed on bills with everyone from Dan Mangan to Two Hours Traffic. Made up of excruciatingly talented musicians and sound engineers, Scott Bell, Jobi Mihajlovich, James Lamb, Stephan Mihajlovich, and James Green, their dynamic recordings, and explicitly mystical lyricism are exemplified by a fantastically dance inducing stage performance. The Buffaloswans are bound to immediately breeze right into your heart, and leave you with magic in your mind days later. Buffaloswans have just finished work on their second studio album, 'The Body Electric', a full length post-modern exercise in beauty, atmosphere, space, consciousness, and love. And are taking a brief break from performing to shop the new record around and plan to see more of you in the world next Spring! Stay tuned!